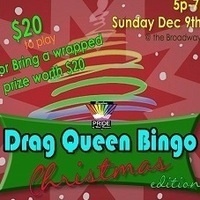 Join us for another exciting Drag Queen Bingo filled with O-69's and lots of Ho Ho Ho's! $20 to play OR bring a wrapped/gift bagged gift of $20 value for admission. Your donated gifts are the prizes, with a few donated Extra Special Game prizes too! Viki Williams is back as your Ho Ho Hostess with Stephanie Michelle Williams as our ball turner. Get ready for an overload of holiday cheer!